This entry was posted on December 1, 2017 by Woven Monkey. It's the start of December so that can only mean one thing... 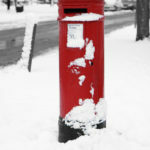 It's time to tell you our Christmas postal deadlines. All orders placed before these cut-off points should arrive before 25th December. Theses orders will be sent by Tracked 24 or courier. You must make your order before 12pm on the deadline dates stated above. For UK customers most of our items are sent Royal Mail, but for larger orders this will be through our courier UK Mail or TNT. International orders are sent by standard Air Mail.